If you're looking for some great ocean fishing while on vacation you won't be disappointed by the number of first class Key West fishing guides and charter boats available. The famous author and fishing enthusiast Ernest Hemingway himself helped put Key West deep sea fishing on the map. You'll have a chance to experience some of the best offshore fishing to be found anywhere in the gulf. There is no other spot on the planet with more world record fish caught than the Florida Keys. You'll find a wide selection of offshore deep sea fishing charters available to choose from. Most charter boats will offer rates for either a half day (4 hr.) or full day (8 hr.) of fishing. A few will even offer a split 6 hour trip. The average fishing charter boat will accommodate up to six fishermen. 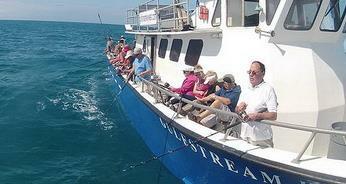 GULFSTREAM FISHING - Easily the Best Charter Boat Fishing Bargain in Key West! For those of you that thought a fishing charter is way too expensive to fit your budget we've found the perfect answer for you. Gulfstream Fishing offers, hands down no questions asked, the best Key West party boat fishing bargain to be found in Key West. Gulfstream offers a six hour fishing charter for as little as $58.50 ea.if you book on-line with them. Most of the party boats only offer a 4 hour trip. Kids 12 and under also receive a discount at $36 (booked on-line) or even free if they are five and under. Even though you will be sharing the boat with others, the experienced crew is known for providing each of the passengers the type of service found on the much more expensive charters. Their boat the roomy 58" Gulfstream IV, is equipped with a comfortable galley area and features a full service food menu and beverage menu. The Gulfstream IV departs the dock each day at 10:00 am and returns to port at 4:00 pm. We highly recommend them for a fun day of fishing at a basement bargain price. They are located at the Historic Charter Boat Row. to help you plan your next fishing charter. BOOYA CHARTER - fish w/Capt. Pat on your next Key West Deep Sea Fishing Adventure. Located at the Charter Boat Row Key West, FL The Booya I & II vessels are the latest in the state of the art boats. Their deep sea charter boats will help insure your trip is a huge success. No stay at our resort condo would be complete without a day spent out on the ocean. Booya uses only top of the line tackle for many different types of fish, including Tarpon, Dolphin, Wahoo, Tuna, Snappers, Permits & more! Call Captain Pat and he will get you hooked up for a great day spent fishing! Located just a short distance from our vacation rental is Delph Charter. Delph is a full service charter service that features a wide range of world class possibilities. They specialize in deep sea fishing but will tailor your charter to fit your desires. They offer reef, wreck, deep drop, flats, kite, Fly, bluewater, and live bait angling. Their top notch fishing guides pursue all of the most popular game species to be found in the area surrounding the Keys. The forty foot Southbound is a custom fiberglass Sport charter boat which features the latest in marine electronic gear, twin diesels and five fighting chairs. Packages are available. They have 8 hour, 6 hour, or 4 hour rates plus custom charters are available. 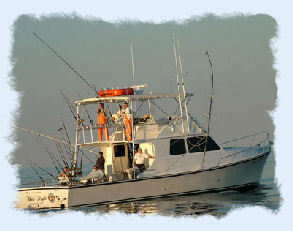 They offer both deep sea fishing or reef excursions. All bait, licenses and gear are provided by Southbound. Bring your own food and drink, they will provide the ice and coolers. Trophy Sport fish in the tropical waters of Key West. Charter Sea-Clusion does it in style. They have one of the most extravagant and enjoyable boats to fish from in the Keys. They offer competitive rates and cater to the rank beginner to the die hard tournament fisherman. 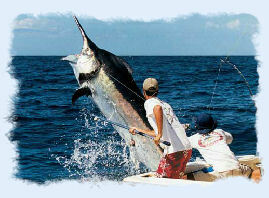 They also feature many angling options including off-shore, wreck, reef and drifting. LINDA D CHARTERS as featured on a number of TV shows and documentaries! Centrally located from most of the condo rentals in Key West is the Linda D Charters. The Linda D has a long pedigree of hosting many famous people including: Curt Gowdy, Lee Greenwood and the governor of Florida. They have many different deep sea fishing options available including private or shared charters for either a half or full day. They've been is business for forty years. They will take care of the bait, gear, ice, and licenses. The Eva Marie offers both inshore, reef or offshore angling for up to six people. Their vessel features a kitchen, roomy seating area, sleeping for six, and a head. Whatever your angling preference they will do their best to provide you with a world class sporting experience. They have all the great gear you will need with a number of packages available. When you are considering a charter company you should consider Key West Charter. Steve has a solid reputation for bringing home the catch. You bring the food and beverages they will supply everything else including some of the best deep sea angling in the Caribbean. Steve is the prowd owner of the thirty seven ft. Custom Sporting boat Fish Check, which features a generous cabin area with a private head, a generous bridge with ample bench seating, stereo, and a refrigerator. Their deep sea charters can accommodate up to six people. Also located just a short distance from our condo rental is Key Limey Charter. Tony specializes in either deep sea fishing or on the Flats with an emphasis on Fly Fishing. Tony has a tremendous twenty year track record with a back ground in commercial angling with rod & reel. They will supply everything you will need but the food and drinks. You will also have the option to split the cost with other fisherman if you so choose. 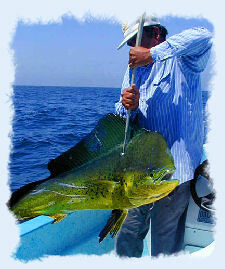 COWBOY FISHING CHARTERS - Enjoy Air Conditioned Comfort with a World Class Crew. 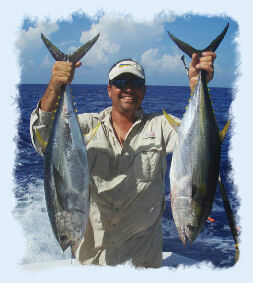 Join Captain Mark Baumgarten on your next fishing adventure in the Florida Keys. Mark uses nothing but state of the art equipment including his 36 foot Hatteras boat that has many of the comforts of home. Cowboy Fishing Charters gives you the option for a private charter or you can share the cost with a shared trip with other customers. This is a great way to make your trip more affordable. Cowboy Charters offers full day, 3/4 day or 1/2 day excursions depending on your budget. KEY WEST SPORTFISH DEPOT - over Thirty Plus guides. Featuring over thirty + seasoned captains and featuring the best boats in the area. They have a reputation of providing quality, experienced guides who specialize in Reef, Deep Sea, & Flats angling with a long history of success. Many different packages and options to choose from. They have one of the largest selection of full time guides to choose from and specialize in corporate outings with many fortune 500 companies as previous clients. They can handle 1 to 100 people and guarantee your enjoyment, with thousands of satisfied customers. LETHAL WEAPON CHARTER - Join Captain Ted on a shark adventure! Lethal Weapon is an aptly named modern, well equipped and air-conditioned forty three foot sport vessel. You'll be able to enjoy your deep sea fishing adventure in complete comfort with their state of the art boat. They will pursue all of the most popular game species in the Keys area and their main forte is sharks. They have as an option a 2, 3, or 4 day trips to the Dry Tortugas National Park. They are very flexible and will customize your trip to suit your needs. MR. Z FISH TALES CHARTERS - One of the largest charter services in the Keys! Mr. Z is considered one of the Florida Keys more extravagant sportfish yachts. At 39 tons and 46' ft. the Bertram is one of the largest charter boats in the Keys. It's fully air conditioned and can accommodates up to 6 guests. They have stereo system, CD player, refrigerator, freezer, carpeted salon and a fully equipped galley. Odyssea invites you come experience a taste of what real Caribbean sporting action is all about. They will offer you an excellent chance to catch the whopper you might have always dreamed about. Odyssea offers deep sea trips for any species worth catching in the Florida Keys. They focus their efforts based on the time of the year to help insure your trip will be success. Captain Rush Maltz has a life time of experience in the waters of Key West! Join Skipper Bennett Taylor for an excursion aboard the Outer Limits, a specialty crafted forty one foot yacht, which features air cond., roomy and comfortable salon, working head, fighting chair and generous fly bridge area. 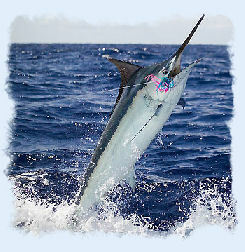 Captain Bennett's specialty is the highly sought after Sailfish using live bait. They will do what it takes to give you the best opportunities to catch trophies with room for up to six anglers. Custom trips available! There is no other location on earth that provides you with the multitude of options that Key West can provide you! Key West deep sea fishing with captain Pepe is as good as it gets. 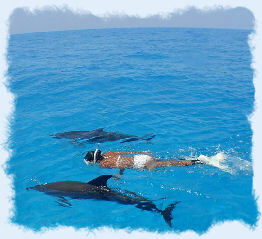 Skipper Pepe takes advantage of those options and provides a wide array of custom trips to suit your individual tastes. Whether it's deep sea, light tackle or flats angling Pepe does it all and the fact that he grew up in Key West has given him the edge to insure you a successful voyage. The Saltwater Anglers main claim to fame is fly fishing. They are at the pinnacle of their profession when it comes to fly fishing the waters surround Key West. Their guides are experienced, some of the best in the business, and they can offer even seasoned fly fisherman many tips on how to hone their craft. They do however offer any kind of angling imaginable in the Key West area. KEY WEST SPEAR ONE CHARTERS -Spear Fish With Steve Born and Raised in Key West! Skipper Steve Rodger has been commercially angling since he was sixteen years old. Steve is also an experienced diver which has also provided him with vast knowledge about fish behavior in the Key West region. SPEAR FISH with Steve, one of the few charter boat operators to offer this exciting underwater adventure, which is their specialty! They also offer great fly angling trips and will custom tailor your package to whatever your desires may be. Captain Paul Tryon is a member of the Florida Guides Assoc. and has been featured on ESPN and the Outdoor Life TV show. Paul's forte is light tackle angling but they offer a full array of charters for you to choose from. Paul is a great guy and has many thousands of satisfied fisherman to prove it! They take on only private trips to further add to your enjoyment. Join Skipper Art for some of the best hard hitting action that you will find anywhere on the seven seas. Captain Art's vesel the "wild Bill" is a 37 foot diesel powered sporting boat that features the latest in electronics, top end gear and four fighting chairs. They specialize in angling with off shore live bait and are flexible in their pursuit of available species. Art's price includes livebait, all the gear, ice and licenses. Captain Joe Mercurio is the skipper of the sleek and modern 46 ft. Bertram deep sea charter boat. The Bertram features all the latest electronics, air conditioning, kitchen, sleeping quarters, bathroom, and nothing but the finest in fishing gear. Captain Joe specializes in deep sea offshore charters but will accommodate his guests if they prefer the faster paced action of the reefs. Captain Joe is a seasoned guide with over forty years experience guiding in the waters of the lower Keys. We Offer the Finest Vacation Rental Condo Rental in Key West Fl! and Deals in Key West.